Long cardio machine waitlists, overbooked group fitness classes, and a packed free-weights area might be signs you have a popular fitness facility. But they could also be indicators that your members are looking for a space upgrade or rework, especially if other corners are empty or filled with unused equipment. Bourque suggests seeking feedback often from facility users and paying attention to whether you’re attracting and retaining the type of clientele you want. Also take notice of the following signs your fitness facility isn’t keeping up with the times. Then make space adjustments accordingly. Running a circuit or boot camp class in an open area might tempt others to join in. 1. You’re lacking the ability to offer multiple options for group fitness during peak times. That means thinking outside the literal box of the studio space. Gyms should have dedicated mind-body rooms or indoor cycling rooms, of course, but a facility can and should also utilize its main area for group fitness when possible. Run a circuit or a boot camp class in a spot where you have functional training units and plenty of floor room, for example. “If you don’t have the ability to do that today, it’s something to certainly look into to be able to stay current to the needs of the populations that you’re serving,” he says. Main floor classes also make group fitness options visible to others who are doing their same old solo workouts. After watching a few times, maybe they’ll be tempted to try something new. Gyms should have dedicated mind-body rooms or indoor cycling rooms, of course, but a facility can and should also utilize its main area for group fitness when possible. 2. You have an abundance of barely used equipment taking up valuable floor space. If you’re lacking square footage for functional training equipment or to perform functional training, you either need to expand your center or look around for equipment to take out of service. “Sometimes you can’t change the facility’s footprint, but you can change what’s inside the footprint,” says Jim O’Leary, senior vice president of operations at EXOS. Although selectorized strength machines were popular in years past, they’ve rapidly gone out of style in the last half decade as people flock to more efficient methods of exercise. Facilities aren’t getting rid of that bulky equipment, however, because it’s likely still in good shape after a steady decline in use. Cardio machines with updated tech can help members reach fitness goals more efficiently. Take a look at your cardio offerings, too. Providing various machines isn’t enough. To remain relevant in today’s new fitness movement, cardio equipment needs to be interactive or tech-enabled so people can tie their workouts into smartphones, fitness wearables, and apps, O’Leary says. Tech-enabled functionality also provides more opportunities for small group training on the floor. Coached high-intensity interval training workouts on Precor equipment is just one example. Again, people crave more efficient ways of achieving their fitness goals, and tech helps with this. Incorporating tech-based equipment that helps members maximize their time in the gym also helps reduce cycle time and enables facilities to move more people through the space. “They’re getting the same workout in half the time, and you’re able to get people on and off, which reduces the waitlist,” says O’Leary. Is your gym layout hurting membership? Find out. 3. Your class or group fitness rooms aren’t easily converted into open-use functional space. Group exercise rooms fill up during peak hours when classes typically take place, but often they go unutilized otherwise. “People are kind of reticent to go into that room to do different types of activity,” Bourque says. If you can find a way to direct flow into that studio or integrate it into the main area, the room increases your functional space. Switch out equipment that nobody uses for more efficient methods of exercise. Group exercise rooms fill up during peak hours when classes typically take place, but often they go unutilized otherwise. 4. You’re still compartmentalizing fitness with designated areas. 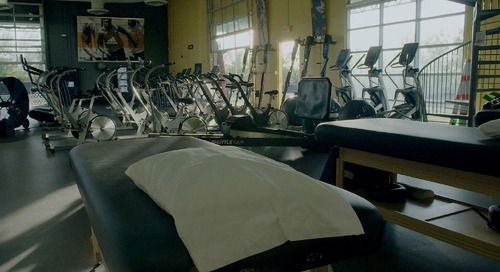 The typical fitness facility’s main floor configuration employs rows of cardio machines, an area for selectorized strength equipment, and a free-weights space with some mats for stretching. This compartmentalization puts users at a disadvantage. To get in a balanced workout, they waste time and energy traversing the entire space. The arrangement also hinders the ability for personal trainers and fitness instructors to do their jobs efficiently and effectively. “When you do a class, which we certainly recommend doing on the floor and creating that opportunity for people, it’s really hard because you have to help people navigate all across the facility,” Bourque says. Fitness centers that have designated areas can also be intimidating to folks just embarking on new fitness journeys. Bourque describes a crowded free-weights space filled with people doing advanced movements and banging around plates. That setting can deter new users from venturing in. He recommends reorganizing spaces into well-rounded hubs of activity that meet users where they’re at. Use social- and community-based programming that resonates with millennials. A beginner space might be more machine-based with treadmills, recumbent bicycles, some selectorized equipment, and an open area for stretching and warming up, for example. Some intermediate equipment is also nearby. An intermediate area might have a mix of cardio equipment like elliptical and stair machines along with treadmills. Cables, free weights, kettlebells, and a functional rig could also make up this hub. Looking to stay ahead of the competition? Check out fitness center trends to watch in the next five years.